Hawai`i's only AAA Five Diamond and Mobil Five Star resort. Newly renovated and set on beautiful Wailea Beach, this resort combines Hawaiian elegance with uncompromising luxury. Discover Aloha enchantment with chic sophistication in Maui's most spacious guest rooms. Guests receive a wealth of complimentary services, activities and facilities. 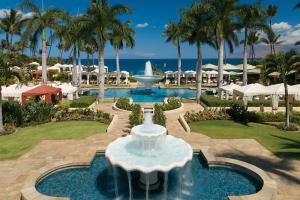 The spa, golf and dining at Maui's three best restaurants offer a tremendous value. In Wailea Resort area, approx. 17 miles from Kahului Airport. Seasons, Ferraro's at Seaside, Pacific Grill, Lobby Lounge, and In-Room Dining.